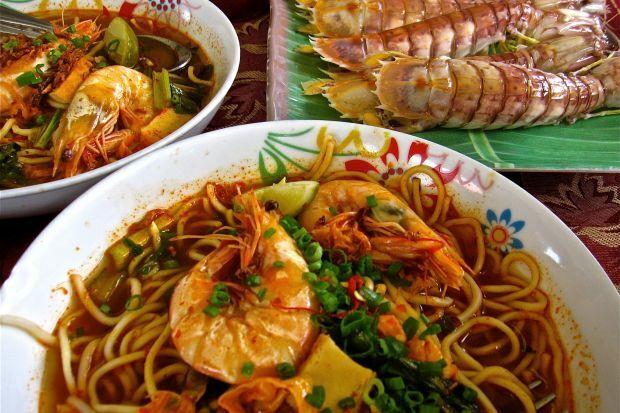 Pulau Aman has fresh, affordable seafood galore. LOCALS proudly claim that Pulau Aman, once home to the country’s first Inspector General of Police, the late Tun Mohd Salleh Ismail, is one of the safest and most peaceful places to live in. Here, no one’s a stranger and while a number of shops sell local produce and food, competition is friendly. In fact, the stall owners will even recommend that you sample what their competitors have to offer before you leave the island! The biggest, and arguably the most popular, eatery here is Restoran Terapung Pulau Aman. It’s a family-run business that puts quality above quantity, and while its menu is limited, the food will keep you coming back for more. The fried rice is a hot item and from RM6, diners can opt for either the mee, kuey teow or bihun udang fried or served with gravy. Checking “special” (in the order sheet) simply means additional prawns (and RM4 on top of the RM6 price). Personally, I fancy the mee udang kuah as the gravy’s sweet and spicy tomato taste strikes a nice balance on the palate so that the tongue is only mildly “on fire”. The kuah is a watery stock unlike the thick mee jawa gravy though they look similar. Perhaps the former is best described as the Malay version of Hokkien mee. While the mee udang is good, the side dishes, unfortunately, only comprise a selection of steamed seafood. Just line up at the jetty and choose the live creatures you want and the cook will steam them for you. Dipped in your basic bottled chilli and tomato sauces, the flavoursome freshness of the seafood is retained and you can almost taste the salt water with every mouthful. My only grouse is with the sauce. I think a homemade sauce would taste better – a concoction with lime juice, garlic and freshly blended chillies would certainly enhance my favourite steamed mantis prawns. Oh, and be warned that it takes a certain skill to remove the mantis prawn shell, but the payoff is well worth the effort. Mahani Abdul’s family members preparing the kuih kapit. And to wash it all down: A refreshing mix of lime and assam – the restaurant’s signature drink – is highly recommended, especially in the afternoon heat. The enterprising 52-year-old started his business in an old, wooden restaurant by the old Pulau Aman jetty – that was back in 1990. Today, the blue shack that has seen better days is still around although four years ago, Abdul Halim moved to the new jetty where his restaurant looks out to the Second Penang Bridge. “I always knew one day that I’d own a nice restaurant just like the big ones I saw outside of the island. “I’ve since had ministers, state leaders, government officials and even the foreign media come here,” he says, proudly pointing to the many comments in his guest book. A stern-looking man of few words, Abdul Halim can usually be found sitting by the jetty waiting for the fisherfolk to bring in their daily haul. “Even the famous Bukit Tambun seafood restaurants get their supply from here. Look at the size of the mantis prawns, crabs and fishes. “The mantis prawns are even exported to Hong Kong,” he says, eagerly leading me to the stacks of containers filled with the huge, live sea creatures. Now, if you prefer white rice with an assortment of local dishes, five minutes on foot will lead you to Warung Kak Timah. The restaurant serves roti canai, kuih, nasi lemak, cake and nasi campur in the morning besides the prawn noodles Pulau Aman is famed for. For lunch, Fatimah Din, 47, caters to special requests for seafood dishes and white rice. “The dishes are prepared kampung-style with sambal and spices. “You can either buy the seafood (from the jetty) yourself and bring it to us to cook or you can pre-order and I will prepare everything,” she says. Warung Kak Timah is one of the four eateries on the island. For the last 16 years, her prawn, chicken and squid have kept customers coming back for more. She dips them in a secret flour mix before deep-frying them in boiling oil. A stone’s throw away, Mahani Abdul, 64, can be seen hunched over a charcoal stove making kuih kapit – an “all-festivals” snack, she says. “My mother used to make it for Hari Raya and since more tourists are coming to Pulau Aman, I decided to open a stall selling snacks, including kuih kapit, three years ago. “I used to only sell sukun (breadfruit) chips but the trees only bear fruit twice a year so I thought, why not make kuih kapit?” she says, grinning. Mahani is only one of the many makeshift stalls catering to tourists on the island. Pulau Aman, with a population of less than 300, is possibly one of the last few remaining traditional Malay villages in the state. It is in Simpang Ampat, Seberang Prai Selatan, a 10-minute boat ride from the new Batu Kawan jetty. The boat fare is RM6 return. Most of the islanders offer homestay packages and bicycle rentals for those who want to spend the night and experience the idyllic village lifestyle. If you are planning on staying the night, here are some suggestions on how to “keep busy”: you can go fishing, swimming, cycling (look out for the island’s resident deer), camping, trekking up the 300m-high Bukit Aman, island hopping (oh, do request to stop at Pulau Gedung, a former pirate hideout with some interesting spots like Batu Perompak, Makam Purba and Gua Lanun) or digging for the sweet and succulent, siput biji nangka! Some historic sites to look out for on the island are the 1789 Telaga Emas (the well never runs dry even during a drought!) and Malaysia’s oldest breadfruit tree dating back to 1891. Which brings me to one of my favourite Malaysian snacks – deep-fried, crunchy sukun chips (which locals also use in curries). 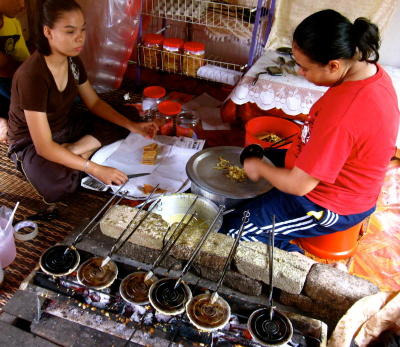 You can get the chips at the little stalls or from a shop by the jetty but if you are lucky and a makcik happens to be frying it outside her house, you can buy it hot out of the wok. Other must-buy items are the prawn and fish keropok, belacan (shrimp paste) and salted fish – tasty, authentic kampung stuff, these! The fragrant belacan is top notch simply because the shrimp used in it are fresh. The salted fish eaten with freshly pounded sambal belacan and steaming hot white rice and ulam is a truly Malaysian meal – cheap, healthy and tasty. My first visit to the Island of Peace was some five years ago. The new jetty wasn’t built yet and visitors had to gather at a seafood restaurant just beside the Bukit Tambun pier, unsure which of the old, rickety fishing boats were “Peace-bound” – there were no signboards! The boat ride took half an hour and the fare was only RM4 (RM2.50 for children) then but otherwise, the 116ha island has remained largely unchanged. For reservations call Warung Kak Timah (013-433 4932 / 018-570 2030) or Restoran Terapung (016-495 5125 / 019-476 6125).